← Creating radical autonomy: Errekaleor Bizirik! If attention today is often focused on urban experiments in autonomy, rural examples are by no means few, both in the present and the past. And if we often neglect the latter, or dismiss them as hippie folklore, we do so at our own peril. Contemporary capitalism increasingly erases the distinction between the urban and the rural, by violently colonising the countryside, reducing it to an industrialised source of food for the cities, or to an appendage for “weekend” urban leisure. Outside of this frame, rural modes of life are redundant, condemned to disappear, or an obstacle to be suppressed. In this context, “returning to the land” or “defending the land” (or even “extending the land” into urban space) takes on considerable urgency as a way of creating and sustaining autonomous forms of conviviality. From spain, we share the example of the okupation of Fraguas, a small village in the Northern Mountains of Guadalajara of Castilla-La Mancha. Initiated in 2013, it is now threatened with eviction and destruction by state authorities. 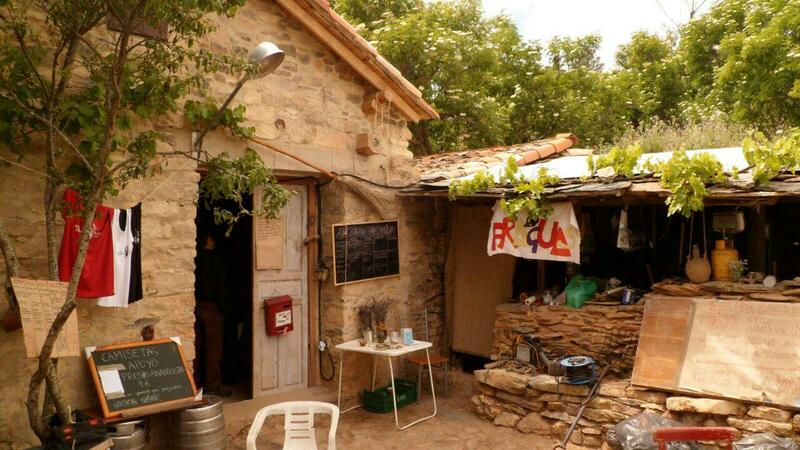 We have shared accounts of similar or parallel projects elsewhere, though at times in different contexts (the ZAD in france, Genuino clandestino in italy, Somonte in andalusia, and different examples of “rural” autonomy in greece). All of them point to the essential place of land in capitalist production and social reproduction, as well as for the need, felt and real, to politically intervene in this “space” if non-capitalist forms of life are to become realities. In the context of spain, we must add that the Fraguas okupation is contemporaneous with two other okupations, that of the Errekaleor Bizirik! in the basque region and the La Esperanza in the gran canaria. They all took place in 2013. And while not being the only okupations that occurred during that time, nor okupations emerging from identical contexts or motives, they do point to the powerful resonance of the 15th of May movement in that country. In other words, 15M, while not being the immediate cause of these okupations, has spawned currents that continue to flow in unpredictable ways. One cannot also but fail to admire the courage of the those who have created this community, a courage indispensable to those who would do more than talk about revolution. Below then we share a statement from the Fraguas okupiers in response to the threat of eviction, as well as an interview conducted with Regeneracion libertaria. Fraguas is a project of rural community okupation in the northern mountains of Guadajara. 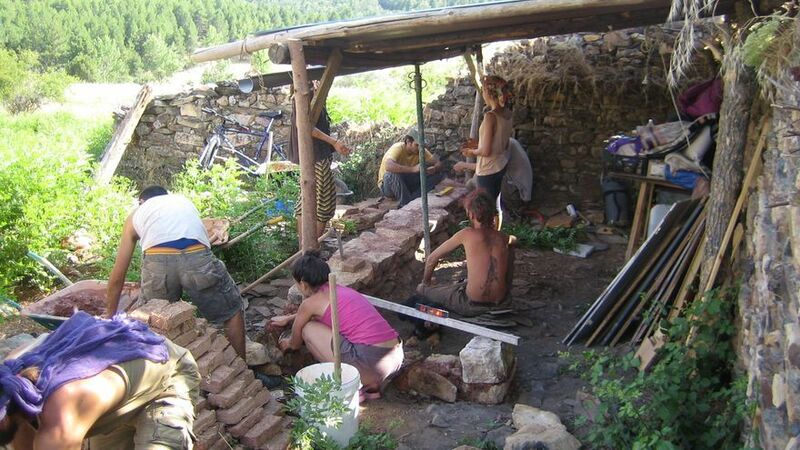 Since the spring of 2013, the members of this project have been rebuilding the ruins of the old village of Fraguas (that was already intentionally emptied and destroyed). We struggle for community, self-government, self-sufficiency and self-management. To materialise these goals, we thought it necessary to return to the countryside, therein to live realising our dreams in equilibrium with the natural environment. From the moment of our arrival, we were “invited”, with threats and fines, to abandon the space that we were rebuilding by forestry officials [“agentes medioambientales”] and guardias civiles. For them, one cannot return to the countryside except as if it were an annex to city life: weekend visits, natural parks as tourist scenarios, or as salaried labour as the only possible option for sustenance. Some of us now carry the burden of fines of thousands of euros for trying to develop alternative models to the insane cycle of salaried labour and massive consumption. In June of 2015, 6 of us were called before the 4th court of instruction of Guadalajara, accused of the crime of usurpation. The accusation is brought forward by the Regional Government of Castilla-La Mancha [“Junta de Comunidades de Castilla La Mancha”] and the Attorney General [“la Fiscalia”]. It seems, after expelling the rural population for decades, generating the social and demographic desert that is visible today, that this is normal and desirable, while recuperating abandoned villages is usurping territory. Today, there is a new tightening of the screws in the process, adding to it the crimes of damage to and violation of territorial planning, and the threat to demolition the houses that presently stand. They speak of re-population, but think of destroying houses. For each one of us, they ask for 4 months in prison and 600 euros in fines for the crime of usurpation, 2 years in prison for the crime of violating territorial planning, with a further 2,250 euro fine, and two years in prison for damages, and an additional fine of 26,779.17 euros shared out between us to cover the costs of demolition of what has been built. In total, almost 4 and a half years in prison for each person for having sought the unbelievable madness of giving new life to an abandoned village; taken together, it amounts to 26 years of incarceration. After receiving the indictments, we are awaiting notification of the date for the trial. Needless to say, we are not going to submit to the designs of the Regional Government of Castilla and we will oppose directly the planned eviction and demolition by the State. For all of this, we ask all of you for support, to whatever degree possible; that you come, to know us; that you spread the word about this experience; that you support the initiatives that continue to be developed and that you remain attentive, if there is an unexpected eviction. From the moment that we learned of the eviction threat to this rural okupation project in the small village of Fraguas (Guadalajara), we contacted the group that manages the initiative because we believed that it was precisely by doing an interview, where they would answer all of our questions (and they were not a few) and our desire to know in the first person, that this would be the best way to diffuse their project and show them our solidarity. We thank them enormously, their answers to our questions, and we hope that in making known this project, that you have as strong a desire as we do to get to know it in person, to support them against the repressive process that has been initiated against them, and to strengthen ties so as to keep alive this endeavour in autonomy and rural conviviality. To begin, we would like you to tell us a little about Fraguas. What is its geographical situation and ecological context? What is its recent history? Fraguas is a village in the Northern Mountains of Guadalajara, the lands are part of the Municipality of Monasterio, of which it was a parish and the government of which belongs to the Regional Government of Castilla-La Mancha. The lands are considered by the administration as belonging to a Natural Park, despite the fact that most of the land is dedicated to the mono-culture of pine, with artificial terraces covering most of the surrounding hills. The first historical references date from the 15th century, however when the area begin to be settled is unknown. From the decade of the 1960s, of the last century, the Franco regime began a campaign of clearing the hills of people (in which there are many more abandoned villages waiting for you) with the excuse of planting pine trees. In Fraguas, in particular, they began by expropriating their land so as to impede them from grazing their animals, they took away their doctor and the school, and they were tricked into also selling their houses. The last inhabitant to leave, Don Benito, was in 1968. From then on, they actively destroyed what remained, bulldozers bringing down roofs and even as functioning as a scenario for military practice in the 1990s. Since then, the village was abandoned, until we arrived in Fraguas in April of 2013. When did you discover Fraguas and what were the motives to start the project of occupying it? We discovered Fraguas in 2012 after bringing together two small groups of people with similar concerns and a common desire to okupy Fraguas. At a collective level, in addition to individual motives, our motives to okupy, inhabit and reconstruct Fraguas were and are, through community, self-sufficiency, self-government and economic self-management; the desire to put into effect an autonomous and horizontal model of conviviality at the level of production and consumption that contests what is pre-established and which could carry us beyond our own personal capacities. It was a longed for return to the countryside. What projects have you developed in the village and which are you currently developing? We have principally three challenges: the reconstruction of the village, self-sufficiency and conviviality. 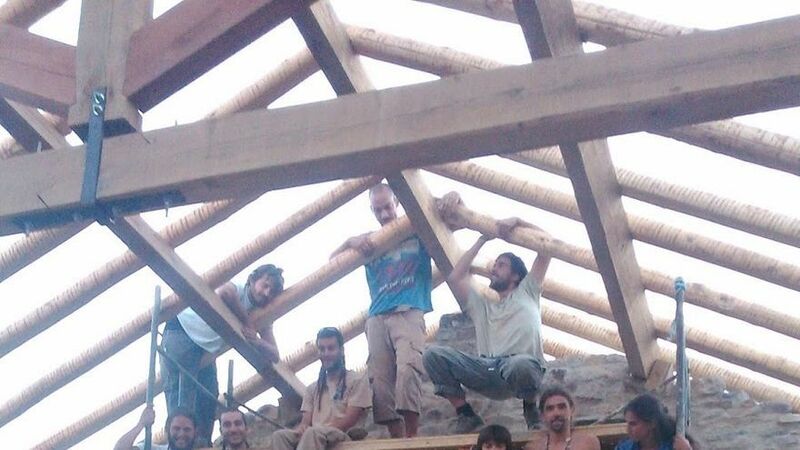 At the level of the first objective, we have rebuilt three houses and we have another three works in progress. As regards real self-sufficiency, we are still far off, but it is a clear tendency that marks the project; we cover our electricity needs thanks to solar energy. Conviviality is our great challenge, which we work on day to day. How have you managed the project during all of this time? (Work groups, assemblies …) How has this model of management changed with respect to how we understand it in the city? The management of the project has been through horizontal assemblies, prioritising group work, without specialisations and managing from the perspective of what is common. The principal difference is the project of convivial community, tied to all of the spheres of our life, companionship, leisure, work and political struggle. From what you have learned in these years, how would you describe the experience of rural okupation? What obstacles have you found? The experience in general is lived with great enthusiasm; to see and feel a group of empowered persons, managing the lands and spaces of their lives in the most autonomous way that we know, is truly heartening. The principal obstacle is ourselves. Conviviality marks one and many people have left the project because they failed to properly manage conflicts. Another obstacle of course is the state’s power which from the beginning has clamped down on us with fines and as of today, 6 of us are accused of usurpation of public land, violation of territorial management and damages. They are asking as punishment for 4 years in prison and a great deal of money. Is life difficult in the countryside when you seek the greatest degree of self-management?Do you have contact with the city? In our opinion, life in the country is not more difficult than life in the city. It is true that our work load is brutal and that emotionally we are tired, but it is known that effort done with pleasure is not painful and that we are convinced by what we are doing. Of course we maintain contact with the city, almost all of us come from large cities and therefore our environment is there. Furthermore, we don’t just want to be a bunch of crazies who head off for the mountains. We want to remain tied to other struggles in the city and to serve as an example (as others are for us) of a return to the countryside, but under different paradigms. Do you value the possibility of allying yourselves with the social and political movements of the cities? Certainly, we are part of the social and political movements; being conscious of the distinct methods of struggle, solidarity and mutual aid are values that we have to foment between the urban and rural struggles. Recently, we learned that they want to evict you. Can you tell us briefly since when did this threat emerge. And who is behind this intent to evict and what interests they have in Fraguas? The pressure from the Regional Government of Castilla-La Mancha began almost before okupying Fraguas, with government officials and forest guards warning us about what their response would be. The fines began the year we arrived, already with the threat from the forestry officials that the complaint was being processed through criminal proceedings. In June of 2015, we were called before the 4th court of instruction of Guadalajara, accused of the crime of usurpation of public land. During the month of April of this year, we received the formal accusation, to which were added the crimes of violation of territorial planning and damages. The complaint originates with the Council of Agriculture, the Environment and Rural Development [“la Consejería de Agricultura y Medio Ambiente y Desarrollo Rural”]. The interest that they may have is control and power over land, the securing of property and the destruction of alternative practices to their model of society. What repressive penal or economic measures do they want to impose? They solicit, for each of the persons accused, a fine of 600 euros for the usurpation of public land, 2 years in prison for the crime of violating territorial planning, another 2 years for damages and a total of 26, 677 euros for those who have civil responsibility for the damages (justified by the costs of demolition and the waste management resulting from the same). Are there any strategies for the resistance that you could tell us of? In the short term, our strategy will be to get the word out about the project and morally contesting the legal action of the authorities, something which they lack. In the long term, it is our firm conviction to defend the project. Further information may be found at the Fraguas okupation blog. A more detailed article on the okupation can be found in spanish at el diario. This entry was posted in Commentary, Interview, News blog and tagged autonomy, Land Okupations, Occupations, revolution, self-management, spain. Bookmark the permalink.